Many of the binge and emotional eaters I have worked with have tried to use diets to help them maintain their weight. Sometimes this can work for a few days, but often it can lead to uncontrollable cravings and more binging on foods. I know someone who can diet for only two days and another who was able to stop for two years; but both got the same results in the end; irrepressible food cravings and weight gain. It’s as if they were both holding their breath or holding in their stomach and when they couldn’t hold their breath or hold their stomachs in anymore they had to breathe in or “eat in” to feel alive again. I truly believe restrictive diets are not the real answer to losing weight, especially not for compulsive eaters. It’s a temporary technique that always end up making problems worse. So what is the best way to lose weight while putting emotional eating under control? So what is the secret to a lasting slim shape and food happiness? It may seem so simple that if I tell you now, you may just brush the idea off and return to yoyo dieting or denial with thoughts like; “I can diet tomorrow”, “I can stop whenever I want to” when you haven’t for days. We both know it’s probably a thing you’re telling yourself to make yourself feel better while really making matters worse. If I were to tell you that years of listening to doctors, diet experts, your parents and any other authority figure who has constrained your diet, telling you never to eat or drink this or that – is what is keeping you binging and away from your ideal weight – how would you react? It’s not that these people are bad or ill intentioned. It’s more that you’ve learned over time to trust them more than you trust yourself. For example, I know someone who completely stresses out in a restaurant when it’s time to order. She’s calculating in her head the glycemic index of each ingredient to figure out what to order. She’s worried what her friends will think of her if she orders rich food. Another worries what will happen if she just can’t help ordering large portions and feels out of control. Neither is enjoying the time they are sharing with their friends or loved ones because they are concerned about what they SHOULD eat. Feeling guilty about eating the “wrong kind of food” is also a huge factor. Usually it’s because someone, somewhere told you that it was going to make you fat or was bad for you. I remember that once when I said in a webinar that I was perfectly fine with eating cheese cake, someone replied: “but when you have eaten the cheese cake you have lost”. Lost what exactly? And on what basis? I don’t have a super-high metabolism and I hardly exercise. I’m actually a little ashamed to say that I have hardly exercised for months and yet I’m still slim. My weight can vary a little but it stays pretty much the same. Before you tell yourself that I’m lucky to be able to eat cheese cake, feel super cool about it and on top of that not gain weight, let me ask how you would feel if you could do exactly the same? I don’t have extraordinary genes like some would like you to believe. I have got fat several times in my life, but I have always refused to diet. By which I don’t mean that I gorge endlessly on ice-cream and cake. I have adapted my diet with age and I eat some foods very moderately, but I do have cheese cake once in a while. It’s pleasant. I enjoy it, but it doesn’t make me feel alive or like I’m breathing again. So how would you feel if you could do the same? Just feeling good about what you eat? Eating what you want and staying slim… It’s really not a dream any more. It’s about how to make it a reality. Please don’t be baffled by the simplicity of the principles below. They work extremely well. Now that you’re ready to really hear what I have to say, let me share with you the simple, obvious yet secret truth every diet expert is trying so hard to hide from you…. Your body is the best expert on the planet when it comes to eating. For example, Dr Mercola will tell you that you have to eat according to your body type. Each type can eat more or less of each food type, carbs or meat… He will offer you a test to help you determine which type is yours. I love most of his work but honestly, do you really need him to let you know what your body needs and thrives on? I say absolutely not. What you must do is trust your body and yourself. I know it may seem impossible right now, but you can. You just have to have the willingness to explore beyond what other food experts tell you. Don’t get me wrong. I do listen to what they have to say and I sometimes try new things, but I always check how my body reacts. For example, how do my bowels feel after eating a certain type of food or a combination of certain foods? Which foods promote calmness or stress? Which foods feel addictive, even to the slightest degree? Which food gives me bad breath or constipation? My body’s reaction to food is the only indicator I fully trust. For example, I know that juicing is good for me, because within hours after drinking vegetable juices my skin looks more hydrated and younger. So you can keep an open mind about what other people tell you while constantly reminding yourself that your body is the expert. It will show you or tell you by the way it looks and the way it reacts to food. What you need to develop now is a curiosity about how does it make you look and feel. Avoid foods that give you stress, cause inflammation or feel addictive. You can continue to eat these foods in moderation as long as they don’t keep you completely off balance. For example, I know that I am better off eating dark chocolate in between meals because it creates some sort of inflammatory reaction in me when I combine chocolate with other food. I will not stop eating chocolate altogether, though. I don’t eat it all the time, but I do still eat it occasionally. Learn to differentiate cravings from hunger then discover how to eliminate cravings in minutes. I have created a whole article to help you control your cravings and identify true hunger signs. I strongly suggest you read it. 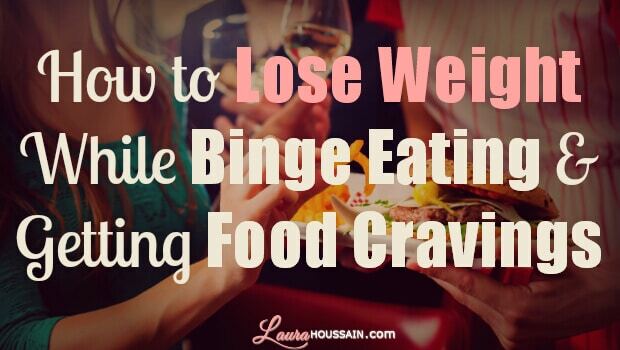 Controlling cravings and eating when hungry is the one of best ways to avoid binge eating and lose weight at the same time. Once you know how to do that, you’ll be able to identify your hunger and body signs more accurately. You’ll eat when you’re hungry, just the right amount of food and the right type of food. You won’t have to go over the glycemic index or any complex food chart, just monitor how your body reacts to food you’ve eaten while it’s being digested, and adapt your next meal using that information. It’s an ongoing process, as your body may request different foods at different times. Some people may find it hard to identify their body signs at first. Years of abuse has made them hard to recognize. But, if you’re willing to trust your inner guidance and intuition, you’ll be able to understand the right type of foods for you. Let go of guilt about eating the wrong food once and for all. I’m convinced that perfect eating is an illusion. Perfectionism is a rampant disease. Perfectionists usually strive for excellence in an attempt to make up for their lack of a sense of self-value. I used to be a very dissatisfied perfectionist myself, in the belief that if I could have the perfect body, I would be good enough or loved and accepted or visible… It’s simply not true. The truth is that you are good enough right now but that you fail to believe it. “Guilty eating” is eating while feeling guilty about what you eat. It’s those words “cheating on your diet”… Let it go. If your body says it’s fine to eat cheese cake, eat cheese cake. If it tells you, that you had enough, you’re either gaining weight or have body warning sign, drop it for a while. It becomes very easy once you know how to stop cravings. I read about two months ago that people who feel guilty about what they eat tend to gain more weight that those who don’t. So let go of guilty eating right now. I’m convinced that guilt around eating and food causes binge eating disorder and worsens, not improves your situation. Now you may wonder why, I haven’t told you about my secret diet that will make you slim. Where are the food charts, the guidelines…? I have a few, but right now the most important thing I want to convey to you is that you should trust yourself first. Train yourself to identify when you’re hungry, what you feel like eating, check if it’s real hunger or food addiction and then enjoy your meal. Eat slowly. Take the time to chew. (For more info on this read my article on how to stop mindless eating ). This will help you gain full control of what you eat and lose weight WITHOUT ever dieting. I know that hundreds of articles, experts and TV shows scream at you every day that you must diet to lose weight…. The only diet you must follow is the one your body dictates. When you’re hungry eat. Eat what you intuitively feel is nourishing and easy to digest. Ask yourself “how does this food, food combination make me feel”… Soon, you’ll be the most trustworthy food expert when it comes to YOUR diet and weight-loss won’t be that much of an issue. But before you can become the master of your own food again, you must learn to control cravings. I know very powerful techniques that can help you achieve that in minutes. Subscribe to my newsletter now, and gain instant access to one of most powerful craving busting techniques I know. Please enter your name and email below.